What can be cuter that Frozen themed Meerpups? What can be cuter than a little meerpup? How about two meerpups dressed up as characters from Disney’s Frozen. Compare The Market are offering free Frozen themed meerpups if you purchase insurance through their website between 22nd December 2016 and 3rd March 2017. So If your looking for Home, Motor or Pet insurance why not give them a try and you could soon be hugging a little Oleg as Olaf or Ayana as Elsa. Shareholders Club screening of Vaiana / Moana. The Euro Disney S.C.A. Shareholders Club is hosting an exclusive Shareholders Club members screening of John Musker and Ron Clements newest Walt Disney Animation Studios animated movie: Vaiana / Moana on Friday 20 January 2017 at 8:00 PM at the CinéMagique theatre in the Walt Disney Studios Park at Disneyland Paris. Shareholders who wish to register their interest in attending the event should visit the Your Personal Space section of the Euro Disney Shareholders Club website. Shareholders will be able to bring three friends / family members with them and the screening will be held in French. Two new Villages Nature promotional videos released. The Villages Nature resort which is scheduled to open in the summer of 2017 have released two a new promotional videos this month. 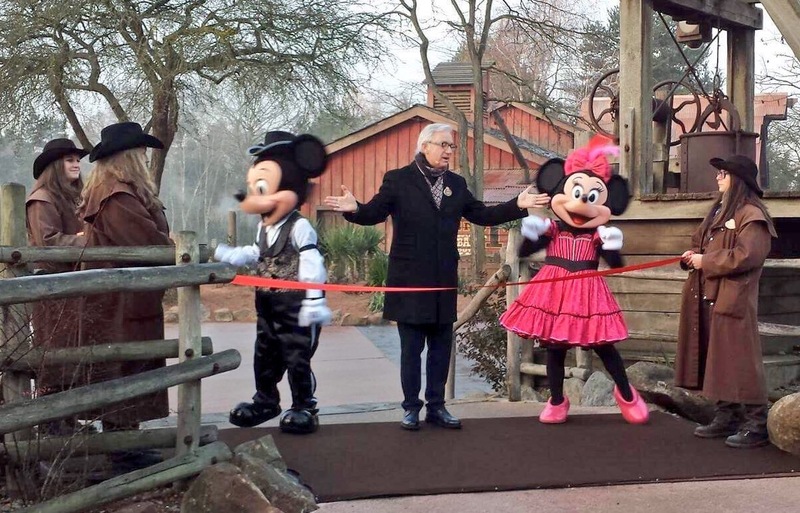 The €500 million resort which is located just 20 minutes away from Disneyland Paris opposite the Davy Crockett Ranch is a joint venture between Euro Disney S.C.A. and Pierre & Vacances-Center Parcs. Developed over 120 hectares at its opening, Villages Nature includes 916 cottages and apartments and will offer several areas for discovery, recreation, and relaxation, including its Aqualagoon, Lakeside Promenade, Extraordinary Gardens, BelleVie Farm, and the Enchanted Forest. 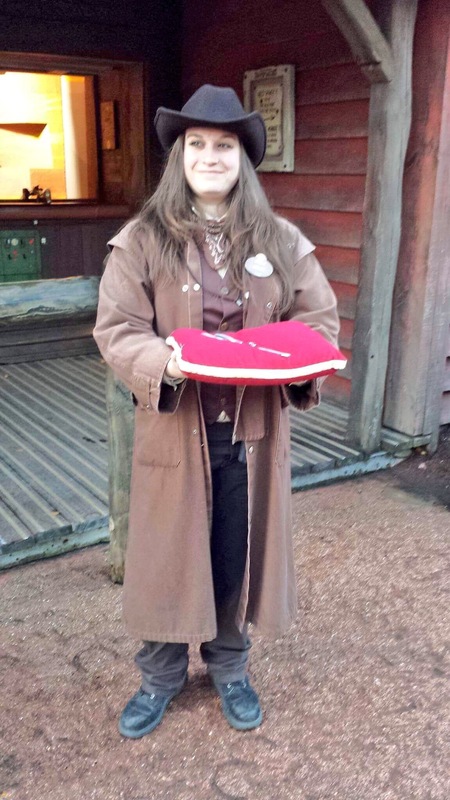 Big Thunder Mountain at Disneyland Paris was officially reopened this morning after a year long refurbishment. 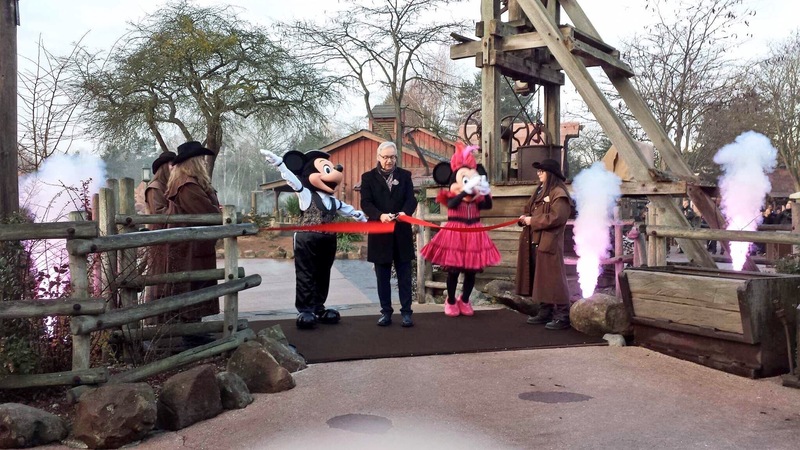 Senior Vice President and Chief Operating Officer Daniel Delcourt, Mickey, Minnie & the Frontierland Cast Members took part in the ceremony and our friends from ED92 were there to capture the occasion. 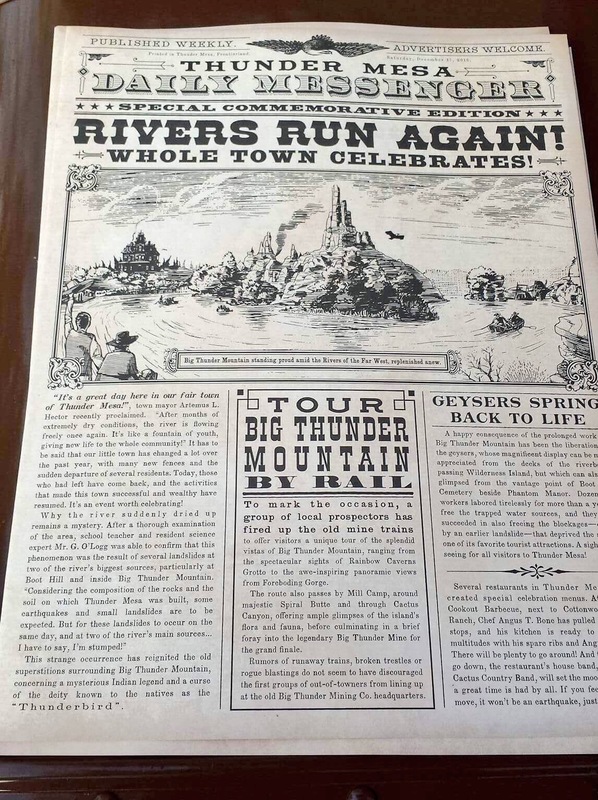 To celebrate the reopening a special edition of The Thunder Mesa Daily Messenger was published for the occasion. On Friday 16 December at 8:00 PM on BBC Radio 2 John Barrowman hosts an evening of Disney’s Broadway Hits from the Royal Albert Hall. An all star cast from Broadway including Scarlet Strallen, Ashley Brown, Joshua Strickland, Alton Fitzgerald White, Merle Dandridge, together with the London cast of Aladdin, sing songs from ‘Beauty and the Beast’, ‘Mary Poppins’, ‘The Little Mermaid’, ‘Tarzan’, ‘Aida’, ‘The Hunchback of Notre Dame’ and many more, including the Tony Award winning ‘Newsies’. The concert also features a special guest appearance by one of Disney’s masters of music, the musical theatre and film composer – Alan Menken (Little Mermaid, Beauty and the Beast, Aladdin, Pocahontas, Little Shop of Horrors, Tangled, Hercules). The show was recorded at the Royal Albert Hall on 23 October 2016 with the BBC Concert Orchestra, conducted by Keith Lockhart. The show will be available to listen again after the broadcast from the BBC website. Walt Week: Celebrating a Legacy of Imagination, Creativity, and Innovation. 15 December marks the 50th anniversary of Walt Disney’s passing, and to honor the man, The Walt Disney Company and D23, The Official Disney Fan Club, will be celebrating Walt Disney’s legacy of imagination, creativity and innovation with a variety of initiatives and homages throughout the company during “Walt Week”, December 5 – 15, 2016, 50 years after Walt Disney’s passing. Disney Theme Parks around the world are invited to take part in the celebration with a special “Walt Disney Message Board” that will be available to Guests visiting the Parks in Anaheim, Orlando, Tokyo, Paris, Hong Kong and Shanghai. The message board will serve as a platform for Guests to write a special message and / or memory to share with others (Message examples might include: a special Disney memory or a “thank you” to Walt Disney). There will be a message board, located inside the gates of the each Park, and will only be available on December 15, 2017. At Disneyland Paris, it will be installed in Liberty Arcade, near the Statue of Liberty Tableau. Guests will write special messages on magnetic Mickey-­shaped icons and place them on the memory board for all to see. Think of a giant autograph wall with lots of Post-­It notes. The memory board is three-­dimensional and the Mickey-­shaped icons can be placed throughout the board. After December 15th, the boards from each Park will be packed away and shipped to the D23 offices in Burbank where they will be reconditioned to be displayed at the D23 Expo in Anaheim in July 2017. CITY A.M. on Sunday also reported on the legal action being taken by French hedge fund Charity Investment Asset Management against The Walt Disney Company and Euro Disney S.C.A. Walt Disney has charged Euro Disney nearly €1bn in licensing fees over the past decade, and minority shareholders have had enough, saying the American entertainment giant is preventing the owner of Disneyland Paris from making a profit. Reports show Charity Investment Asset Management (CIAM), a French hedge fund, said Walt Disney scooped €930m (£780m) in royalties allowing Euro Disney to use characters like Mickey Mouse at a rate at least three times the standard market practice. CIAM has taken the company to French criminal courts for misuse of corporate assets, publication of inaccurate accounts and misleading information, while fighting a second civil case for shareholders to be reimbursed the nearly €1bn of overpaid fees. The firm has also said Walt Disney hid the value of 5,000 acres of land around Paris which Euro Disney is developing. Walt Disney offered €1.25 a share, but CIAM said the land was independently valued at €1.9bn, which works out to €2.40 a share. The struggling theme park had a particularly tough year as terrorist attacks in Paris caused tourism figures to slump. It lost €858m in the year to September 30. Walt Disney said the action was “utterly without merit”. The animated cartoon creator doubled its stake to 77 per cent last year after a debt-for-equity swap was approved by French officials. Shares in the company have lost more than 90 per cent of their value since the company went public in 1989. CIAM’s co-founder Anne-Sophie d’Andlau said the firm thinks Walt Disney plans to take Euro Disney out of the market without properly valuing the company.